Congrats, Leslie! Do you have any suggestions for affordable specialty CEUs to maintain the CEDC? Hey Mojo, thanks! I actually haven't gotten that far with CEU's. It's funny, though, because I was just thinking about that the day I found out that I passed. 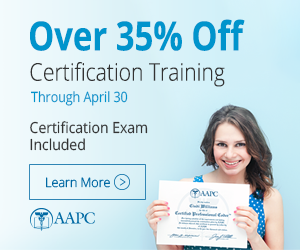 I almost always get most of my regular CEU's from AAPC publications and I also got my membership through AHIMA so I am hoping to get some ideas from there, too. private message me your email if you'd like, and whenever I come across some good finds, I will definitely share where I got it with you. You just never know when you are going to come across something, you know? Right now I have about 20 credits over what I need to renew so I am hoping to select a few out of those to apply towards it, as a couple CUE's were from the CEDC practicum and some were for a short webinar I found online about coding for the ER to help me to study for the exam. Let me know and thanks again! !